Saul Perlmutter (left), Brian Schmidt (center) and Adam Riess (right) at a news conference on Dec. 7, 2011 at the Royal Swedish Academy of Sciences in Stockholm. 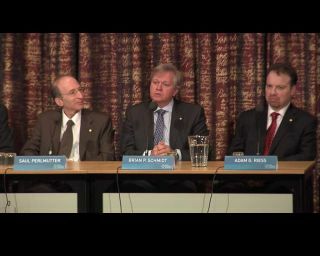 Perlmutter, Schmidt and Riess won the 2011 Nobel Prize in physics for their discovery of the accelerating universe. The three scientists who won this year's Nobel Prize in physics are certainly not resting on their laurels. The trio of astrophysicists received their prizes at a ceremony in Stockholm on Saturday (Dec. 10) for the groundbreaking discovery of the accelerated expansion of the universe. But the researchers are already looking forward to the next major breakthroughs in their field. Saul Perlmutter of Lawrence Berkeley National Laboratory and the University of California, Berkeley, Brian Schmidt of the Australian National University and Adam Riess of Johns Hopkins University and the Space Telescope Science Institute spoke before an audience yesterday (Dec. 7) at the Royal Swedish Academy of Sciences in Stockholm during the so-called Nobel Week to celebrate the year's soon-to-be-crowned laureates. The surprising discovery that the universe's expansion is picking up speed, rather than slowing down as was expected, was made by two teams — one led by Perlmutter, and the other headed by Schmidt and Riess. To explain how the universe's expansion is accelerating, researchers came up with an enigmatic force, called dark energy, that is working against the gravitational forces that are pulling the universe inward. Dark energy is thought to make up 73 percent of all mass and energy in the universe, but the force has yet to be directly detected, and the concept remains shrouded in mystery. "In the case of our discovery of the acceleration of the universe, it's very much a two-part story, where we're waiting for the second part, the sequel," Riess said. "The prize was not given for understanding dark energy. We really have very little clue about how it operates. I think that many of us in the community at large [are] going to be engaged in this process of trying to understand, what is this stuff? What are the basic properties, the basic physics? What is the mechanism that is causing the universe to accelerate?" Riess expressed hope that breakthroughs in the study of dark energy will be made over the course of the next decade. For Schmidt, in addition to trying to grasp what is causing the universe's accelerated expansion, he is eagerly anticipating the next generation of telescopes, such as NASA's James Webb Space Telescope, which are expected to make significant advancements in the field of cosmology. The Webb is scheduled to launch in 2018. "These are new telescopes which are going to allow us to probe the universe earlier and earlier," Schmidt said. "13.7 billion years ago, the universe was created in the Big Bang. After that, the sea of hydrogen and helium created at the time cooled and formed stars and galaxies for the first time, about 200 million years after that initial event. With the new technology online, we're going to be able to look back and see the universe being born." Perlmutter, Schmidt and Riess stumbled upon their Nobel Prize-winning discovery by studying distant stellar explosions, called type 1a supernovas. As they measured the cosmic distances to these exploding stars, the researchers found that the universe was acting contrary to what was expected, and their observations ultimately showed that the expansion of the universe was inexplicably speeding up. While each described the euphoria and disbelief that accompanied the telephone call from the prize committee, Perlmutter, Schmidt and Riess said that their only wish from winning the Nobel is that it will allow them to continue doing the work they are most passionate about. "I hope that we get to keep doing what we're doing," Riess said. "I love doing research. I think getting to do science every day is just the greatest gift."